Two conflicting reports from the United States Department of Agriculture and People for the Ethical Treatment of Animals about conditions for animals in Pitt laboratories have caused a strong reaction among community members. PETA’s “exposé” claims an eyewitness saw a litany of abuses in Pitt labs surrounding the treatment of mice, rats, chimpanzees and other animals. PETA assembled a report and sent it to the National Institutes of Health, alleging mistreatment of animals at Pitt research labs. The report prompted a Feb. 27 USDA investigation of labs at the University. Despite the results of the USDA inspection, PETA senior vice president for laboratory investigations, Kathy Guillermo, condemned the findings as too narrow in scope. Along with other animal rights groups on campus and around the community, PETA organized a protest last Thursday focusing specifically on conditions in a lab in the Department of Critical Care Medicine studying sepsis — a medical condition in which the body injures its own organs while fighting an infection. The lab makes use of rodents in its experiments, which the protesters focused on. Students from Carlow, Community College of Allegheny County and Pitt sat in cages at the corner of Forbes Avenue and Bigelow Boulevard. Some wore paper mouse masks and were silent, while others held signs proclaiming “Wasted $$$, Wasted Lives,” and attempted to interact with passers-by. The argument that animal experiments in Pitt labs were not only cruel, but also wasteful, was the theme of protesters Thursday. One student, rising Pitt senior and political science major Rosemary Geraghty — who attended the protest as a member of the student group Panthers for Animal Welfare — said that many of the people she interacted with were indifferent until told that the experiments contributed little to human health or welfare. Pitt’s statement contradicted this argument, citing a 2016 release from the Foundation for Biomedical Research that pointed out the contributions of experiments involving non-human primates to recent advances in medicine. “The University’s animal research program has led to a number of breakthroughs in medical care,” the release said. 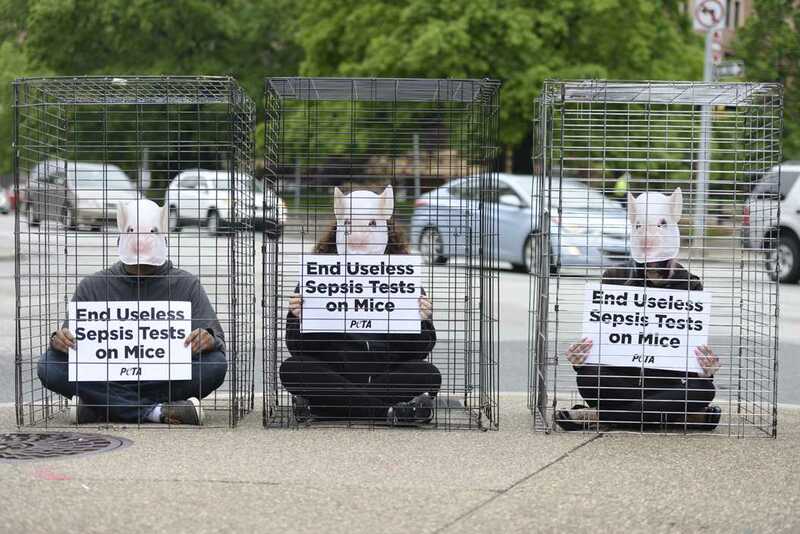 Ashley Byrne, associate director of campaigns at PETA who was present at the protest, suggested that funding for sepsis experimentation on mice and rats amounted to a misuse of resources. A 2013 study funded and published by the National Institutes of Health found that 150 of the drugs developed over the past several decades to treat sepsis succeeded in mice, but failed in human trials. The conclusion was that reactions to sepsis in mice don’t always mirror those in humans. Protesters continued to make demands that the lab either cease experiments on animals or face loss of funding — something Guillermo initially requested in March. “We’re asking for Pitt to end these experiments immediately and to start using modern methods,” Byrne said.